The Japan! Japan! Blog: McDonald's Japan's limited edition Texas Burger! McDonald's Japan's limited edition Texas Burger! Whoops, I forgot to take a photo. 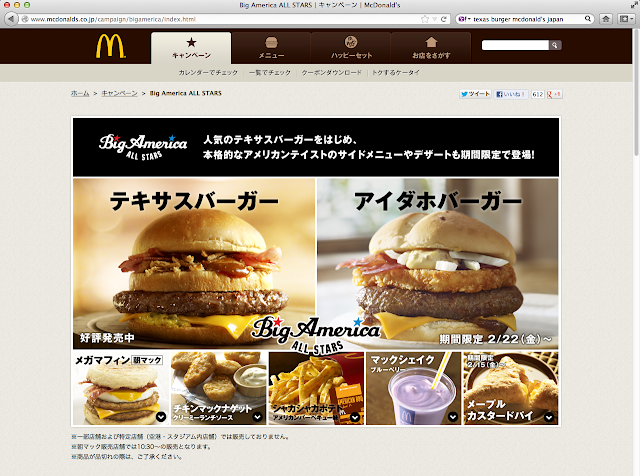 So I just screen-grabbed McDonald's Japan's "Big America All Stars Campaign" page. The burger on the left is the Texas Burger / テキサスバーガー / tekisasu baagaa. There's fried onion rings in there, bacon, barbecue sauce, and I guess a quarter-pounder patty, cheese, and there was a hint of... something. It was good, except that I would personally have less bread in there. I'd eat this again if this were a regular on McD's menu. On the right is the Idaho Burger / アイダホバーガー / aidaho baagaa, which I've blogged about before, I think. It will appear on the menu from February 22 -- I'll keep you posted then, of course! I guess the Texas and Idaho burgers are the bestsellers out of their previous "Big America" campaigns from the last two years. Just to mention, they also have a Mega Muffin / メガマフィン / mega mafin; Chicken Nuggets with Creamy Ranch Sauce / チキンナゲットのクリーミーランチソース / chikin nagetto no kuriimii ranchi soosu; their equivalent of McShaker Fries, i.e. "Shaka-Shaka Potato," American Barbecue Flavor / シャカシャカポテトのアメリカンバーベキュー味 / shaka shaka poteto no amerikan baabekyuu aji; Milkshake they call McShake in blueberry flavor / マックシェイクのブルーベリー / makku sheiku no buruuberii; and Maple Custard Pie / メープルカスタードパイ / meepuru kastaado pai. I've so far tried only the chicken nuggets with cream ranch sauce, which was really good; I really liked it.